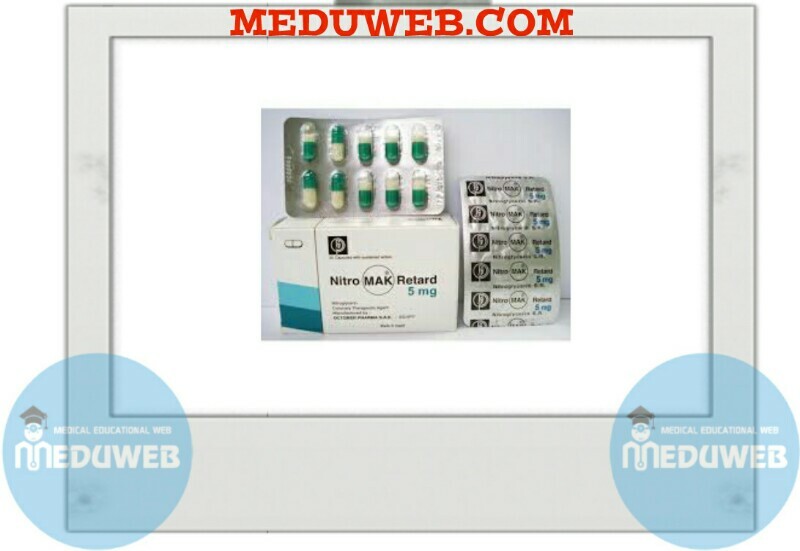 1 capsule of NITRO MAK RETARD 2.5 mg with sustained action contains: Nitroglycerin 2.5 mg. RETARD 2.5 mg and 5 mg, based on continuous release from diffusible pellets enables maximum benefit from the active ingredient both as a preventive and in long-term treatment. Long-term treatment and prevention of coronary circulation disorders; angina pectoris; rehabilitation after myocardial infarction. 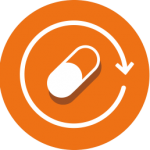 Depending on the degree of severity of the disease and unless otherwise prescribed by a physician, morning and evening one capsule of NITRO MAK RETARD 2.5 mg or 5 mg to be swallowed whole with liquid. The side effects sometimes observed with normal nitroglycerin preparations (headache, fainting & nausea) are reduced in the long-term use. Shock & hypotonic collapse conditions. NITRO MAK RETARD and sildenafil (VIAGRA) may considerably potentiate the blood pressure lowering effect. D0 not store above 30°C. Keep dry. 6 October City – Egypt.